Bravado, the world's leading global music merchandising company, and The Bridge Direct, Inc, a global children’s consumer products sourcing and supply chain management company led by toy industry veteran Jay Foreman, announced today that they have entered into a partnership to launch an exclusive line of collectible dolls, singing dolls, toys and plush based on the music, concerts and personal style of the critically-acclaimed, chart-topping recording artist, songwriter and teenage superstar, Justin Bieber. The announcement was made by Tom Bennett, Chief Executive Officer of Bravado, and Jay Foreman, President and CEO of The Bridge Direct. The new Justin Bieber toy line will debut holiday 2010 with the JB Style Collection Figures (SRP $17.99), Justin Bieber Music Video Collection Singing Figures (SRP $27.99) that each “sing” a portion of one of Justin’s most popular hit songs and come with fun accessories, In Concert Microphones (SRP $14.99) that play two of Justin’s hit songs with cool sound effects, and the cuddly and collectible Signature Plush (SRP $7.99). “We are delighted to be working with Jay and his team at The Bridge Direct,” stated Tom Bennett, Chief Executive Officer of Bravado. Members of the media will be given a first look at the Justin Bieber toys today at the annual Time to Play Holiday Showcase in New York City. The products are expected to be available in major mass retailers on or before December 4, 2010 and will begin to be available for pre-sale orders online starting this week, so fans can reserve their dolls early. 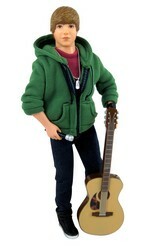 For more information on the Justin Bieber toy line, please visit http://www.justinbiebertoys.com. To receive the most up-to-date news on the Justin Bieber toys, be sure to follow them on Twitter @JBieberToys and “Like” the Justin Bieber Toys page on Facebook. Bravado, the only global, 360° full service merchandise company, develops and markets high-quality licensed merchandise to a world-wide audience. The company works closely with new & established entertainment clients, creating innovative products carefully tailored to each artist or brand. Product is sold on live tours, via selected retail outlets and through web-based stores. Bravado also licenses rights to an extensive network of third party licensees around the world. The company maintains offices in London, Los Angeles, New York, Berlin, Paris, Tokyo and Sydney. Now under the Universal Music Group umbrella, Bravado is able to leverage a global sales and distribution network from the world's largest record company, as well as the group's significant marketing strength. In addition to Justin Bieber, Bravado artists include The Rolling Stones, Michael Jackson, Paul McCartney, Kanye West, Beyonce, No Doubt, Nickelback, Lady Gaga, Katy Perry, Elton John, Guns 'N Roses, Metallica, Led Zeppelin, Green Day and The Killers, among many others. The Bridge Direct, Inc. is a global children’s consumer products sourcing and supply chain management company that provides strategic support and resources to licensors, manufacturers, retailers and distributors. The Bridge’s services include product development, manufacturing, line planning and management, branding, sourcing, quality control and supply chain management, as well as financial, administrative and sales support. Upcoming product lines from The Bridge include: Zhu Zhu Pets™ plush, figures and playsets, Bobby Jack toys and novelties, Busytown vehicles and playsets, and the Justin Bieber toys. To find out more about The Bridge, please visit http://www.thebridgedirect.com.